For many people France is the home of fine food and gourmet cooking. So it is no surprise that as a French Gourmet food company, we combine traditional recipes, the finest ingredients and modern technology to produce our All Natural products. All over the world, people are demanding foods that are guaranteed to be free from chemicals, additives and artificial ingredients. St. Dalfour’s commitment to “All Natural” foods is total. The company is expanding vigorously, introducing new products and concepts but nothing is allowed to interfere with the company’s passion for pure foods made from the finest “All Natural” ingredients. During more than twenty five years experience in the world of fine food, beverages and entertainment, I have witnessed many new and innovative products and ideas. I am proud to say that the discovery of St. Dalfour Fruit Spreads truly tops the lot. From the moment of its arrival in the United Kingdom to this very day, St. Dalfour continues to win the hearts and taste buds of quality minded consumers everywhere. Now you can keep yourself up to date with the information regarding new products, recipes, promotions, events and competitions. I hope you will make the very most of this website . . . . . after all we have made it for you and would love to hear from you if you have any new ideas, recipes or any issues with any of our products. Wishing you good eating and good health. 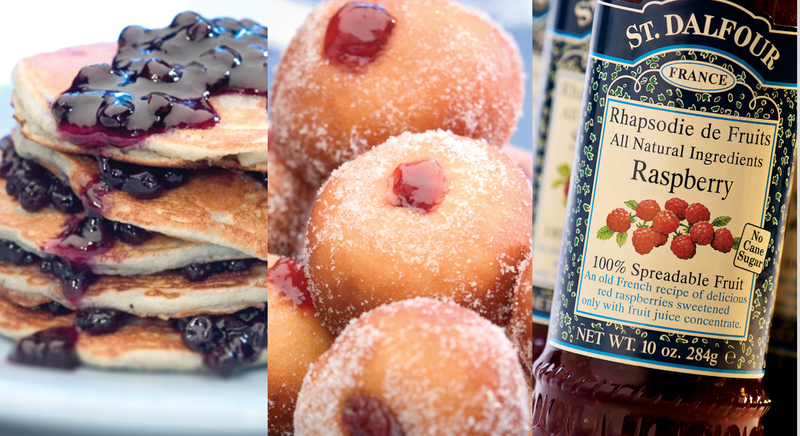 Take a look at our range of recipes which show just how versatile St Dalfour All Natural products can be, We’re sure you will find something delectable to suit your taste buds!